You folks may have read on the internets about our upcoming release of the Ratchet & Clank Collection. Well, we’ve decided to make August 28th an extra sweet shopping day by releasing it alongside the God of War Saga and inFAMOUS Collection! Notice the shiny new things we’ve put on the packaging! What does it mean? Why does Ratchet look so good in green? The answer to most of those questions is that we’re officially introducing our Collections line with these releases on August 28th. Over the years we’ve had all sorts of great deals come your way and moving forward, this is how we plan on presenting them to our consumers. From August 28th on out, you’ll be able to easily spot these classic installments at retailers, as well as on the PlayStation Store, and know that you’ll be getting the greatest PlayStation has to offer — at the best prices around! Come August 28th, you’ll be able to pick these beauties up starting at $29.99! They not only come with some of the best and most memorable games in the PlayStation family, they’re also packed with a few additional goodies to make it worth your hard-earned cash. For longtime fans who may already have a few installments of these franchises, select titles from the Collections will also be available individually — without the extras — on the PlayStation Store. Keep an eye on the Blog as we bring you some additional news in the coming weeks, about which games you can expect to get their own Collections this fall! excellent idea, i’m getting the Ratchet and Clank Collection because to be honest i’ve never played a Ratchet game in my ps2 era just Jack and Daxter but after playing Tools of Destruction i became a fan of the series, i won’t be getting God of War or inFAMOUS collection because i have them all, how about a Motorstorm Collection or bring Motorstorm Apocalypse to playstation plus, you know what would be so kool if you guys can bring Heavenly Sword, Folklore and Lair to psn with trophy support ( now that would be really kool!!!!! ). Hopefully Nariko revive from the dead and we’ll see a sequel. Nice! These are great bundles to have in the end of this great console’s lifetime. I’ll probably check out the R&C Collection. Oh and Sony, why not bundle PSP games on the Vita store. There are a lot of great bundles that could be done (GTA, Final Fantasy, Capcom, etc.). Also, will there be a similar bundle for UC3 after the GOTY edition is released. We’ll announce additional Collections at a future date. i have them all but great price sony !! I have all the God of War games on-disc already, and I might be interested in trading them in to get the new Collection……IF I didn’t already know that it would be outdated in March. Complete collections are awesome, but significantly less awesome as soon as they are incomplete. I’d definitely be interested in a full collection once the series has been put to bed. So God of War 3 is getting 3D Support? Awesome. Is it going to be patched or is it only for this collection? No 3D for God of War 3. I hope that rhyme eases the pain. So glad Sony went with Blu-Ray. You can fit a ton of content on those things. God of War: Is it all disc-based on are they PSN codes? I hope it’s all disc-based. Mixed. God of War Collection and God of War III are in the box. God of War Origins Collection will be via a voucher. Yes i too would like to know the price, I only have just GOW 3 and have been wanting to get the other GOW games when cheap. The God of War Collection will be $39.99! how about GoW3 DLC? it’s not listed here…and i don’t want to download the games..
God of War is laaaaame. I hope SOCOM is included in a future release. Would be nice to play them again. Oh, wow. I was already down for the Ratchet and Clank collection, but this makes me really want the God of War saga collection and infamous 2 collection. I already own ghost of sparta and chains of olympus for my psp, along with god of war 3 on my ps3, but never got around to finding a cheap copy of god of war 1 and 2. Also hope infamous collection will be under 60. 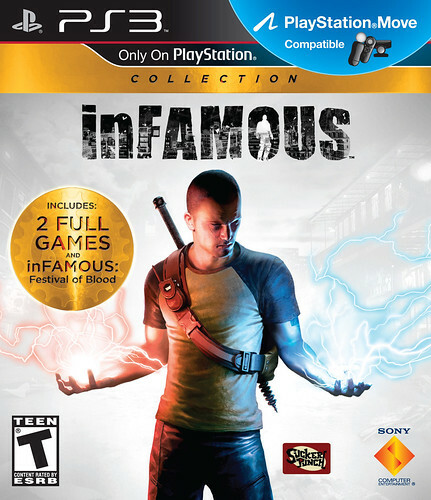 Really want to play festival of blood and infamous 1, I already have a physical copy of infamous 2 and the digital version with the plus subscription, but I know I’m missing out on alot of kessler’s arching story. Hopefully I can play everything before infamous 3 gets announced. I would like to know if the God of War series is all disk based as well. This is a very interesting product line, Sony, I approve! I already have all three InFAMOUS games, so I’m not going to pick up the InFAMOUS Collection. 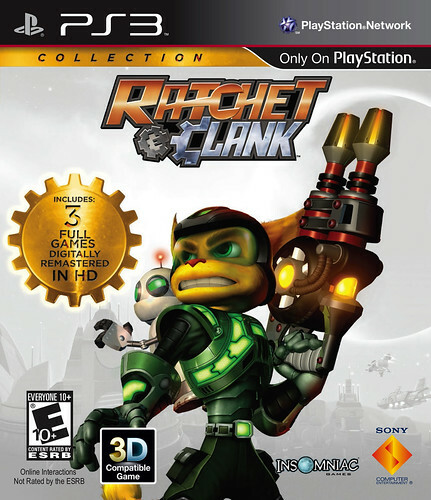 I’ve been considering picking up the Ratchet & Clank Collection (and no, not JUST because of the Sly 4 demo xD). For anyone who’s been considering picking up the God of War games, you have to get this God of War Collection. $30 for FIVE games? It’s a sweet deal you can’t pass up. Find whoever came up with this branding, and give them a raise. And then get SCEE to adopt it too! Digital version on psn store? Kind of. The full value will be at retail only, but you’ll find different kinds of bundles available on the Store when they launch on 08/28. I still want it though, but the entire god of war saga for $30? That would be too good to be true, though I wouldn’t mind that price, lol. Can we expect God Of War:Ascension Beta codes with God of War Saga? SOCOM I, II & III Collection w/ functional online pretty PLEASE, SCEA?! Please we need answers ! GoW is on disc or voucher code to download on PSN (that would be lame). And GoW 3 is 3D in this collection, so I hope we’ll get a patch for the old version, otherwise this is lame too. Awesome new box arts! Now we just need Sony to make another “playstation move” logo, because the actual one is really horrible. Nope. Move Support is just for inFAMOUS 2. The extra missions are mini-missions created by Sucker Punch! 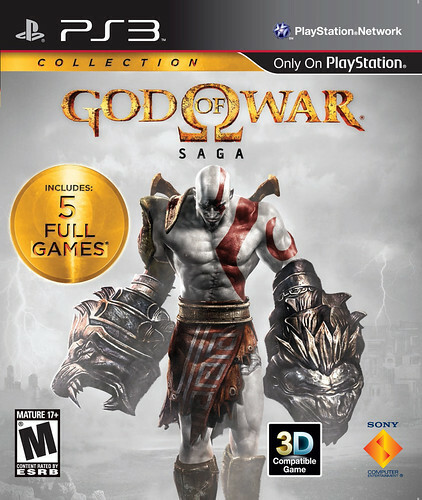 I already have all GOW games and HD versions, but I will still buy GOW saga! I always want to support great games ;D.
Can you include the E3 Demo of GOW Ascension?? Just like you did with the demo of GOW3 and the first HD collection? I’m down for the GoW, already have all the games for their original systems, but as a bundle how can i not upgrade? did playstation plus just sell me god of war origins for 20 bucks a week ago? now they release this that was a low blow sony…..ouch! GOW3 in 3D? That would be AWESOME! Already have all games, so please confirm if we are getting a patch or something! Personally, I’ll just be picking up the Ratchet and Clank HD Collection. cool, can’t wait for these to game though ratchet and clank is the other one i’ll get i already own the first infamous game. Will 30$ be the price for all future collections? They’ll be starting around $29.99. will they be available on psn store???? Hey everybody, were bleeding money like it’s nobodies business and guess what? We are going to release the same games over and over again hoping that people will buy them. Where are all the great RPG games the PS2/PS1 became known for. I’m talking Sony published, Rogue Galaxy for example. Outside of Folklore a launch title, and possibly White Knight Chronicles, I can’t think of one. I’m sure some will say it isn’t the same market that it was 8 years ago, I can except that Dudebro shooters have taken over, but don’t forget what made the PS2 legendary in the market, variety. You name the genre, there were hundreds of games to choose from. Also, did Sony just make a collection of a collection? Oh man, this is really going to damage my wallet. Was just about to preorder Ratchet and clank collection along with the Journey Collection. This is kinda making me iffy on what to do with my copies of older games. I can already expect a Resistance Collection to be inevitably announced, which would be great for me since I want to ditch my greatest hits dual pack of Resistance 1 and 2, but I already own all 3 and would just be wasting cash just because I don’t like red boxes. This is also going to push other publishers like Ubisoft for sure, to probably make an Assassin’s Creed compilation up until Revelations. This… I can expect this to turn into a mess for people who own original edition or older copies of games and aren’t terribly rich. Now I’m confused on a whole what to do with anything, considering I never touch my physical copy of LBP2 because of the digital version given to me by plus. I’m definitely going to be getting the Ratchet and Clank HD Collection. It’ll be nice to play the first three games again. And the Sly 4 demo is always a plus. Wow that infamous cover is AWESOME!!! Right? I dig it. I strike that same pose when I’m debating whether to get a 10-piece or a 20-piece at McDonald’s. I guess I’m going to have to start trading in my old copies towards these collections considering I don’t like duplicates and I have incomplete collections of everything. To everyone saying the God of war saga collection is $30, its not. Or atleast, I HIGHLY doubt that Sony would release Origins, The original collection, and 3 for just 30 when they are all being sold for 30+. It would be a $100 value, so I am expecting a $60 pricepoint for the saga collection. Not too sure about Infamous collection. hey great stuff cant wait for these games finally awsome collections cant wait. any word for us ps+ members on discounts? need to know ok thanks sony your doing an awsome job! looks great cant wait! GOW 3 in 3-D SOLD!!! The writer has been flogged. i cant tell you how many times ive almost bought those two god of war collections.. hopefully the saga is a good price, 40$ maybe? It say’s starting at $29.99, I expect GoW Collection to be $39.99 or even $49.99. Probably the latter, regardless it’s a great deal, I own all the games already and someone who is new to the series I would hope they pick this up. Infamous is probably the best deal, the story is so rich and with those games there are multiple playthroughs to see and do everything. Great news, I love Sony games. Oh, do the collections have a separate trophy set than the originals?